Front Reversals, Wave Traps, and Twisted Spirals in Periodically Forced Oscillatory Media. Phys. Rev. Lett. 96, 018302 (2006) [DOI: 10.1103/PhysRevLett.96.018302]. If spatially extended systems with local oscillatory dynamics are subjected to spatially homogeneous periodic forcing, phase fronts can be observed separating domains where the local oscillations are entrained by the forcing. An example is the light-sensitive Belouzov-Zhabotinsky reaction. The local dynamics of reactants concentrations is governed by the kinetics of the oscillatory reaction. Forcing can be introduced by periodic variation of the light intensity. Another example is the catalytic CO oxidation on Pt(110). Here, oscillations of the CO and oxygen coverage on the Pt surface are possible. Forcing can be introduced by periodic variation of the CO partial pressure. If the oscillations are nearly harmonic, such systems can be described qualitatively by the forced complex Ginzburg-Landau equation (CGLE). We found that trains of traveling phase fronts can undergo a wavelength-dependent propagation reversal. This means, that an isolated phase front and a train of pase fronts can move in opposite directions. Moreover, standing phase front trains with a certain wavelength are possible. That wavelength-dependent propagation reversal be used to trap phase fronts in heterogeneities of the system. In homogeneous systems it can give rise to a new type of spiral dynamics leading to the formation of twisted spirals where inner and outer parts are wound in opposite directions. Video 1 corresponds to the upper panel of Fig. 3 in the article. It shows a trap for phase kinks at 1:1 resonance in a 2D spatial domain. In a rectangular central region the dispersion coefficient of the CGLE is changed. It is chosen in such a way, that wave propagation reversal is possible only inside that region. A pacemaker at the lower left corner emits a kink train with a short spatial period passing the central region. When the pacemaker is terminated no further kinks are produced. When the rear part of the train reaches the central region, the kinks form closed curves which become trapped. Video 2 corresponds to the lower panel of Fig. 3 in the article. It shows a trap for Bloch waves at 2:1 resonance in a 2D spatial domain. Video 3 illustrates the rotation of the twisted spiral shown in Fig. 4 in the article. The spiral performs a rigid rotation. The black dot denotes the rotation center. Since it is located outside the part of the spiral wound around the the topological defect at the tip, some segments of the spiral have to move “backward”. This is only possible if wave propagation reversal is present. Depending on the parameters, the model can undergo a Hopf bifurcation when the temperature is decreased. The Hopf bifurcation is supercritical and leads to the onset of self-sustained oscillations of the CO and oxygen coverage. Further cooling decreases the frequency of the oscillations. Spatially homogeneous forcing can be applied by periodic variation of the CO partial pressure. If the ratio between the frequencies of the forcing and the oscillations is sufficiently close to that of two integers, the oscillations become synchronized with the forcing. Increasing or decreasing of the forcing frequency can lead to desynchronization of the oscillations. This kind of synchronization is called phase entrainment. It results in spatially homogeneous states oscillating with integer multiples of the forcing period. These spatially homogeneous states can be the background for propagating phase fronts. Wavelength-dependend propagation reversal of such phase fronts is possible in a narrow interval of forcing frequencies. This interval can be found just below the threshold where the oscillations becomes desynchronized when the forcing frequency is further increased. This behavior agrees very well with the predictions made with the forced CGLE. We performed numerical simulations for 1:2, 1:1, 2:1 and 3:1 resonance and found front propagation reversal in all cases. The temperature dependence of the oscillation frequency can be used to construct traps: Since the oscillation frequency decreases with dercreasing temperature, the forcing frequency interval with phase entrainment (called Arnold tongue) is shifted to lower frequencies. Consequently, the parameter region with front propagation reversal is also shifted. This means, that for given forcing parameters the temperature can be adjusted such that phase entrainment is possible either with or without phase front propagation reversal. Consider the case that one has phase entrainment without front propagation reversal at a certain temperature. Then, to get front propagation reversal one had to increase the forcing frequency to a value just below the desynchronization threshold. The same effect can be achieved by reducing the temperature: Instead of increasing the forcing frequency the interval with phase front propagation reversal is shifted to lower frequencies. Thus, heterogenieties acting as traps for phase fronts can be created by local cooling of the Pt surface. Video 4 shows the trapping of Bloch phase fronts at 2:1 resonance in a circular heterogeneity. A pacemaker (created by local heating) in the lower left corner emits Bloch fronts which are trapped in the upper right part. The colors correspond to the CO coverage on the Pt surface. The video consists of a sequence of snapshots taken when a period of the synchronized oscillations was completed. Thus, the oscillations of the spatially homogeneous background of the pase fronts cannot be seen. Video 5 shows the final state of the trapped Bloch fronts with a higher temporal resolution. Now the oscillations corresponding to the periodic forcing are visible. The phase fronts in the trap form stationary concentric rings with an inwardly pointing phase gradient. The oscillations of the entire system lead to the appearance of phase waves propagating in the direction of the phase gradient. This gives the impression of a confined inwardly moving target pattern. The variables u, v correspond to the concentrations of HBrO and the Ruthenium catalyst, respectively. The light intensity is taken into account by the additional bromide production Φ induced by the illumination (S. Kadar, T. Amemiya, K. Showalter, J. Phys. Chem. A 101, 8200—8206 (1997)). The bromide production Φ is proportional to the applied light intensity. It can be considered as a bifurcation parameter. A bifurcation diagram of the model can be found e.g. 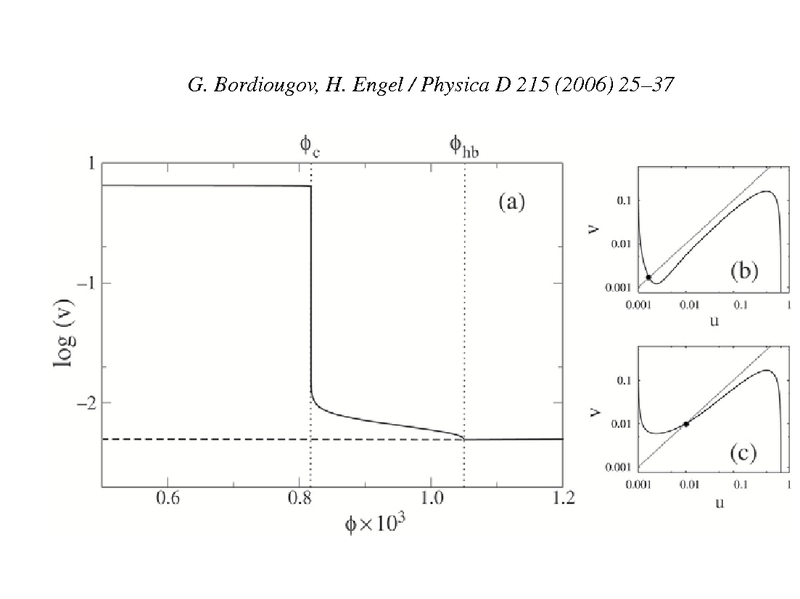 in G. Bordiougov, H. Engel, Physica D 215, 25—37 (2006). For high intensities of the illumination the system is excitable. With decreasing light intensity leads a supercritical Hopf bifurcation at Φ=Φhb to harmonic oscillations with very small amplitudes if Φhb > Φ>Φc. A canard explosion at Φc gives rise to sudden increase of the oscillation amplitude when the light intensity is further reduced. For Φ<Φc one has relaxation oscillations with large amplitudes. Forcing can be introduced by periodic modulation of the light intensity Φ=Φ0+Asin(ωf t). Phase entrainment at 2:1 resonance and Bloch fronts are possible for appropriate forcing parameters if the background illumination is chosen such that the system without forcing is in the oscillatory regime, i.e. Φ0<Φhb. Since the oscillation frequency decreases with increasing background illumination Φ0, darkening of a part of the reactor leads to faster oscillations there. Thus, a darkened region can act as a pacemaker emitting Bloch fronts into the illuminated part of the system. Depending on forcing amplitude and frequency, wavelength-dependent phase front propagation reversal is possible. In our simulations, we found the front propagation reversal in the regime with harmonic oscillations (Φhb>φ0>φc) as well as in regime with relaxation oscillations (Φ0<Φc). In a certain interval of forcing frequencies close to the boundary of the Arnold tongue phase front propagation reversal is possible when the forcing amplitude A is decreased. Video 6 demonstrates the trapping of Bloch fronts in the regime with relaxation oscillations in 2D. Background illumination and forcing amplitude were chosen such that Φ0+A<φc. The oscillations were entrained at 2:1 resonance. A darkened region acts as a pacemaker emitting Bloch fronts in the illuminated parts of the system. In the central region of the illuminated part the forcing amplitude A was halved to have front propagation reversal. Phase fronts become trapped there after the darkened region it is illuminated again and the emission of Bloch fronts stops. The colors in video 6 indicate the spatial distribution of the inhibitor concentration v. As video 4, this video consists of a sequence of snapshots taken when a period of the entrained oscillations was completed. Therefore, the oscillations of the background cannot be seen. The last part of the video demonstrates the collapse of the trapped phase fronts when the forcing intensity is no longer reduced in the central part and thus front propagation reversal is not possible. Video 7 shows the trapped Bloch fronts with a higher temporal resolution. Now the oscillations corresponding to the periodic forcing are visible. This video gives an impression how a trapped Bloch front may look in an experiment.